The Games Master’s Toolkit: To Homebrew or Not? 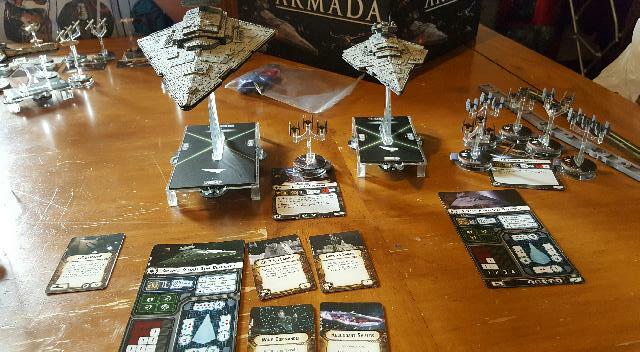 I recently posted about Star Wars Armada, the fleet combat game from Fantasy Flight Games set in the Star Wars Universe. Today I am going to relay my first experience after an Imperial Star Destroyer was added to my collection. If you want to know more about the ISD, you can watch my Imperial Star Destroyer Unboxing Blog. The point of the game was to field an Imperial Star Destroyer, so my first choice was that. There are 2 classes, the class 1 and the class 2. Class 2 has more guns. I picked class 2. Even the mightiest warships need companion vessels/escorts or they risk being overrun. Since the only other (large) Imperial Capital ship that I own is a Victory Star Destroyer, I chose that. Mark 2 has more guns, and according to the lore carries fewer ground troops. More guns swung it for me. Again. Then it was on to upgrading my ships. I decided to put all the upgrades I could on my flagship, one of which was the Ship name. I chose the Devastator, as it was Darth Vader’s ship in Star Wars: A New Hope. The ship, Devastator, increases its forward firepower the longer it fights and the more hits it sustains, which is narratively appropriate as the crew are more afraid of Vader than the Rebel Fleet. I added a boosted comms array so that my Fighters could operate further from their base ship, A Wing Commander to give me the opportunity to change my Command orders to Squadron Orders, Redundant Shields to help my ship survive a bit longer and NK-7 Ion Cannons to destroy Rebel defences. And finally, I had to decide on fighters. In my previous game, I had taken fewer heavier fighters and consequently, the Rebel X Wings were all over me. This time I decided to go for classic Tie Fighters. I had enough points to have seven Tie squadrons, or five Tie squadrons and the Howlrunner named squadron. I opted for Option 2 as the Howlrunner gives major bonuses to other Ties nearby, and it has defence stats. So, with my fleet decided, I looked across the table. Stuart, the Rebel Player was having a hard time choosing. He was fielding a Mon Cal Cruiser, Mon Karren, as it was the only thing comparable to an Imperial Star Destroyer that he owned. But he was struggling to figure out what to have alongside. He wanted Phoenix Home, the Ghost and Hera Syndulla, the Millenium Falcon, Han Solo, some fighters and another freighter. In the end, Phoenix 1 had to go, and Stuart settled for Ghost/Hera Syndula, Millenium Falcon/Han Solo, 2 B Wing Bomber Squadrons, an unnamed freighter and a Correlian Corvette. Battle was eventually joined, my two warships advancing with my fighter cover. Unfortunately whilst I had more fighters on the table, the rebels had several gunship type freighters that can rip apart full squadrons, and Hera Syndulla allowed the Rebel B Wings to function independent of Capital Ships (they murdered my ties with missile barrage fire). Massed fire from surviving Tie Fighters buffed by Howlrunner put an end to Han Solo long before he Disney could take a hatchet to the extended universe, all the while a major bombardment from Devastator utterly destroyed the Mon Karren – whilst the Unnamed Victory Star Destroyer (that I christened Furious) destroyed the Corvette. Unfortunately, the only reason I had Fighter cover remaining was due to the fact that all of the gunships and bombers were targeting Devastator. In a slightly embarrassing turn of events, Devastator was destroyed in the same turn as the last rebel capital ship. Furious and 2 Tie Squadrons remained. They were up against 2 freighters, including the Ghost and 2 B Wing Squadrons. Game rules dictate this was an Imperial Victory as the fighters and freighters flee. If the match was to continue, I am less sure of who would win. I believe the Ion Cannons and Redundant Shields earned their keep. In this close an engagement, the comm tower did not. I took it because I couldn’t afford a Lambda Shuttle, but since my fighters stayed close to the capital ships, neither was needed. I think the Wing Commander was ultimately unnecessary and perhaps next time I will replace him with a different officer, an engineering one. I think Devastator was a good choice, and the Howlrunner squadron was outstanding (probably the only reason the Millennium Falcon was blown to bits). This game looks awesome. Loved the battle report. I’ll have to check it out. You’ve got me interested. Thanks, I only just saw it a few moments ago as up until a moment ago, email notifications were not switched on. I have answered as best I could. can see janie is really after you. from her blog to here. lol and will explore this site to see if i can find another thing that might interest me. There is a fair amount here, all game and geek related. If that is interesting to you, then you may well find other stuff. Did you know you can keep up to date with this website by subscribing to my monthly newsletter? How many people have visited?